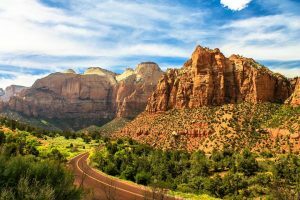 Join us for a fabulous 8 night tour of Southwest, Utah from September 7 – 15 or September 20 – 28, 2019. 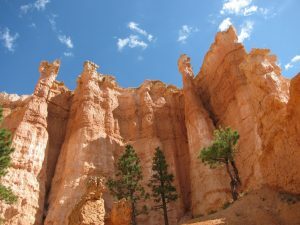 We will visit Bryce Canyon National Park with its colorful hoodoo rock formations and Zion National Park with its tall red rocks, waterfalls and unique hikes. 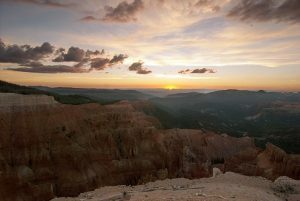 In addition to these two National Parks, we will also visit the impressive Cedar Breaks National Monument and Snow Canyon State Park. Take in the majesty of these Parks. Expect amazing riding, plus the opportunity to hike, take a mule ride, take a guided ranger-led tour or just relax and enjoy the scenery. Note that this is not a flat area and you are riding in areas that are at altitude. Our longest days are 60 mile rides with about 3000 feet of uphills, but even more downhill. All in, you can ride anywhere from 200 to 320 miles in the week of riding. Our tour begins and ends in the city of St. George, Utah. 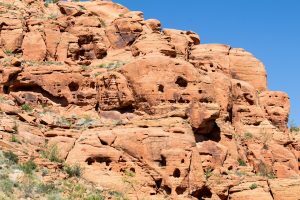 St. George is a 1.5 hour drive from Las Vegas. You can fly directly into St. George or fly into Las Vegas and either rent a car or take the St. George shuttle. Day 1 We will meet at 9am in St. George. (You will have the choice of meeting us at the airport, the Courtyard by Marriott or the St George Shuttle offices). 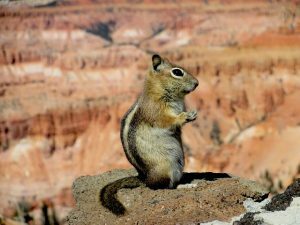 We will then take a shuttle to Brian Head, about two hours north of St. George, stopping at the Cedar Breaks National Monument along the way for lunch and a hike. Brian Head is a ski resort town that is at an elevation of 9800 feet. (St. George is at an elevation of 2860 feet.) You can do the math… There are a lot of downhills on this tour! 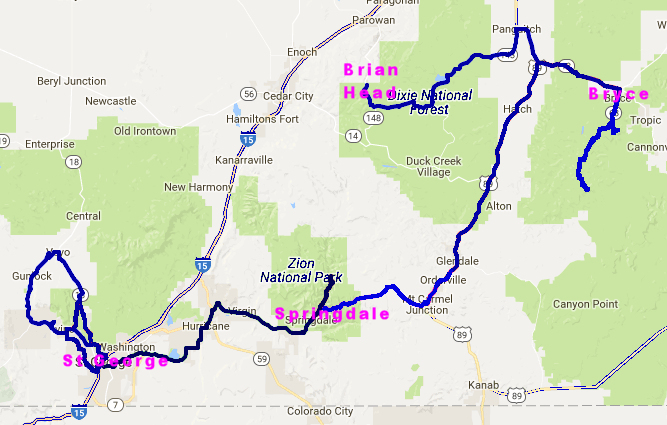 You can assemble your bike in St. George before the tour, or at the Lodge in Brian Head. There is no official ride today but you can ride around town if you want to test your bike out. You can also relax and enjoy the hotel’s amenities including a pool and jacuzzi. We will enjoy a group dinner at the hotel. Today’s ride: 62 miles/3300 feet up and 5000 feet down. 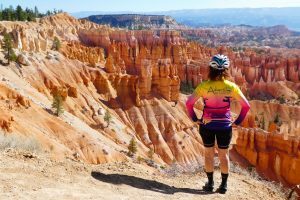 After an initial climb and stop at a scenic overlook, the route takes you on a gradual downhill through the Dixie National Forest. About halfway through, you will pass through the quaint, old west town of Panguitch where there will be plenty of lunch options. 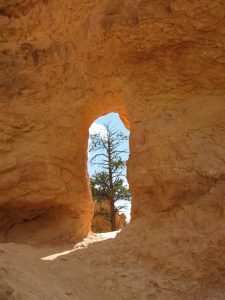 Then the route flattens for about ten miles and ends with a climb into the Bryce Canyon National Park area. We will be staying at the Lodge at Bryce Canyon inside the park. We will enjoy a group dinner at the Lodge. Day 3 Today we will spend the day at Bryce Canyon National Park. You can ride, hike, or do both. 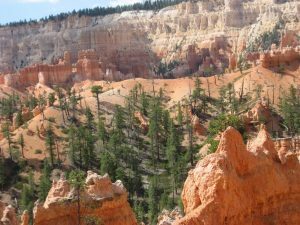 We offer an out and back ride along the rim of Bryce Canyon. You can ride as much as 38 miles with 2900 feet elevation change. 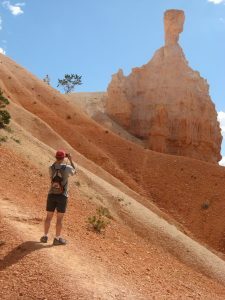 You can also enjoy a hike along the hoodoos. You may want to take a Ranger led tour. It’s up to you. Dinner is also on your own. We leave the hoodoos behind and ride south through breathtaking scenery. Today’s ride is another long one, but with a lot more down than up. The ride is 62 miles with 1900 feet up and 4700 feet down. We end in Mount Carmel Junction where we will stay at the Best Western Thunderbird and enjoy a group dinner. through the 1.1 mile Zion-Mount Carmel Tunnel (no cyclists allowed). After the tunnel, you will get back on the bikes amid stunning scenery and ride the switchbacks into the Park. We end our day in the nearby town of Springdale just outside the park. Dinner is on your own at one of the many restaurants in town. We spend a second day at Zion. 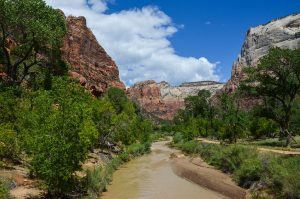 We recommend that you ride the Zion Canyon Scenic Drive. The Drive is closed to most vehicles. The ride today is an 18 mile out and back with 1200 feet of climbing. You can visit Zion, hike and check out the town of Springdale. Be sure to bring waterproof river shoes if you want to hike Zion’s most popular hike, the Narrows. Dinner is on your own in Springdale. We leave Zion and Springdale on our way back to St. George. We will stay at the Inn at Entrada, a golf resort to the northwest of town. The riding is 51 miles with about 2200 feet up and 3200 feet down. We will enjoy a group dinner at the resort. We will offer several loop rides around St. George. 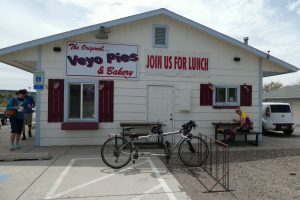 Stop for lunch and enjoy some pie in the tiny town of Veyo. 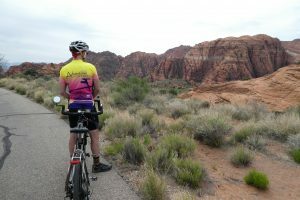 After lunch you will ride along a bike path through Snow Canyon State Park where you will pass through beautiful orange sandstone cliffs and ride along ancient lava fields. We offer rides from 17 to 58 miles. Or you can forego riding and simply enjoy the lovely scenery and pool at the resort. You can even play a round of golf. We will enjoy one last group dinner at the resort. As with most of our tours, we limit the size of the tour to a maximum of 10 couples. The trip costs $5,700 per couple (that’s $2,850 per person). A nonrefundable, $500 deposit will secure your spot on the tour. We require 50% payment by March 1, 2019 and the remainder is due by June 1, 2019. 4 breakfasts, one lunch and 5 dinners. Note that we do not provide any bicycles. We expect that you have a tandem that is in good working order and that you are able to assemble your bike. If you do not have your own tandem, you can rent a coupled tandem from Mel at Tandems East. If you live on the West Coast, you might want to consider renting a bike from Mark at Tandem Diversity. Both Mel and Mark sell tandems, so if you end up renting from them, you might get a discount if you purchase a bike from them. If you have a tandem that is not coupled it is possible to bring it, but you should make sure that all of your flights could handle the larger box. Lastly, Adventures in Tandem has a coupled bike that we could rent to you if the sizing works out. Email us for more details. What is the average mileage per day? Mileage is in the 20-60 mile range each day, with one or two rest days in the week. There is the option to shorten rides if you take advantage of the SAG support, although you may have to be patient as we will be set up for very limited SAG support. Longer rides are also possible, but may be out and backs or repeat some roads that we will ride later in the week. Across the week, expect to ride 200 to 300 miles. There are no sustained steep climbs; however, there are days where there will be some ups and downs. This is not a flat tour. You will also be riding at some points at 10,000 foot altitude levels. This cycle tour is for intermediate level cyclists. While this could change, here are the hotels that we plan to stay in.